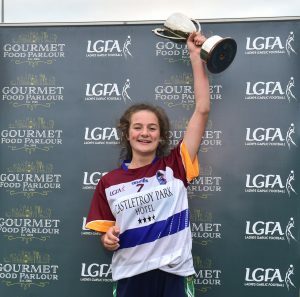 OVER 300 Freshers players from across the country converged on DCU on Wednesday, October 24, for the Gourmet Food Parlour Ladies HEC All-Ireland Freshers Blitz. All colleges were asked to enter teams for the competition, but in the end just three of the four provinces were represented, as UL (Senior), IT Sligo (Intermediate) and DCU 3 (Junior) lifted silverware. There were goals galore across the day in all grades and a high standard of football on show in the group stages, and penultimate rounds of the knock-out stages, before the final parings were known. The Senior decider brought two Limerick colleges against each other, with University of Limerick taking on rivals Mary Immaculate College, in what turned out to be a fascinating encounter. 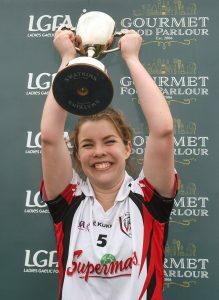 UL claimed the silverware, following a five-point victory on a 4-4 to 2-5 score-line. Both teams began this game strongly, with Mary Immaculate leading to 1-3 to 1-1, Kate Stack netting their goal, and Eimear Kiely and Emma Dineen (2) registering points. 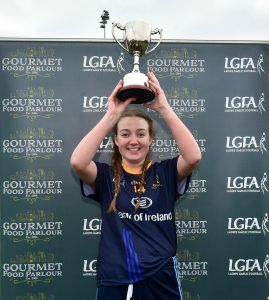 Hannah O’Donoghue scored UL’s opening point, before captain Róisín Ambrose netted their first goal. Richard Bowles’ charges wouldn’t score again until the second half, as UL, managed by Cork Senior Eimear Scally, came to the fore. UL registered two unanswered goals before the break with O’ Donoghue and Lynsey Noone finding the net to ensure a 3-1 to 1-3 interval lead. On the restart, UL had that extra edge, as Maeve McCarthy, Sarah Leahy and Fiadhna Taghney added points. Their final score was a second goal of the game from O’ Donoghue. IT Sligo won the Intermediate title in interesting circumstances as a free-taking shootout was required before the Connacht college lifted the title, after a titanic battle with Maynooth University in the second final of the day. Mayo’s Kathleen McNally fired the winner after 15 frees had been taken, with little luck in terms of accuracy early on, before a string of scores, including McNally’s vital kick. Earlier, IT Sligo edged the lead at the break, as goals helped them to a 2-4 to 0-7 half-time lead, with Deirdre McNally scoring 1-3. The teams were well-balanced on the restart, with Maynooth University shading the scoring as they mounted a comeback. Shauna Quirke and Leah Sweeney netted IT Sligo’s other goals, but the sides couldn’t be separated, on a 3-8 to 2-11 score-line, and free-kicks were required. After the game, IT Sligo joint captain Rachel Connolly accepted the cup, with the captain duties also shared with Ann Sheridan. It was somewhat fitting that the first silverware of the day went to the hosts, as DCU’s third team beat fellow Dublin college DIT, by 5-1 to 2-3 in the Junior decider. The home side laid the foundations in the opening half, and led by 5-1 to 2-1 at half-time. After the game, Monaghan native Aoife Toner accepted the Cup from Con Moynihan of the Ladies HEC.